Apple has released MacOS Mojave 10.14.3 for Mac users running the latest operating system. 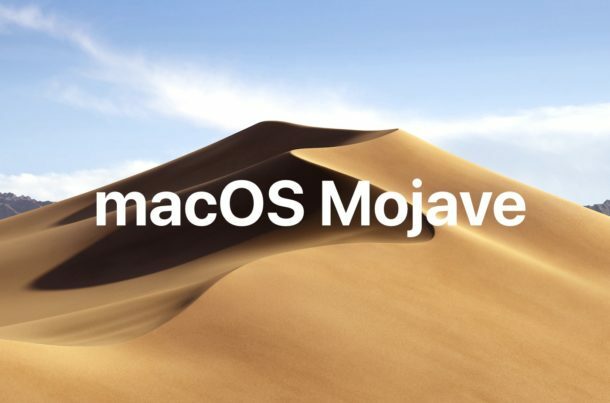 The new release includes bug fixes and security enhancements and is therefore recommended to MacOS Mojave users. Mac users running prior MacOS releases of High Sierra and Sierra will find security updates available in the Mac App Store as well, labeled as Security Update 2019-001 10.13.6 and Security Update 2019-001 10.12.6 respectively, along with an update to Safari. Additionally, Apple has also released software updates for Apple Watch, Apple TV, HomePod, and iPhone and iPad. Users can download iOS 12.1.3 update for iPhone and iPad along with the watchOS and tvOS updates from the Settings apps on those devices. Always backup a Mac before installing any system software update, backing up with Time Machine is easy. Remember that MacOS Mojave has changed how to install MacOS system software updates, moving the update functionality back to the System Preferences away from the App Store. The entire update weighs in around 2GB. Installing system software updates requires the Mac to reboot to complete. Mac users running High Sierra or Sierra will find the Security Update 2019-001 available from the Mac App Store Updates section. The macOS mojave 10.14.3 update improves the security, stability, and compatibility of your Mac, and is recommended for all users. For iPhone and iPad users, iOS 12.1.3 update is available now as well, along with updates to Apple Watch watchOS, Apple TV tvOS, and HomePod. sry but i fail to see any value in this article. Aside from pointing at the update, that it’s there and how you can install it, no other details about what this update is actually doing, and if it should be done or kept away, if it breaks anything (that would of been more helpful). The very same thing could be said about your comment. Care to add anything of value or are you just here to complain? Just updated – seems gmail authentication for Apple Mail, Accounts, and Spark email are all now broken. Can only access mail through browser. There is a small difference…he is stating a fact…and you are just b**ching…wait, I am doing the same! The Combo Update will not install on a system with 10.14.2 installed. The 10.14.3 Update installed just fine. Downloaded the Combo Update and, yes, it will not install over 10.14.2. Will try to download the mere 10.14.3 update, tomorrow. So stupid Apple! Why?! Cannot update either..Do they want us to have issues . The Combo usually is to avoid that!!! If you look at the 10.14.2 Combo Update it is 2.52 GB in size while the 10.14.3 CU is 2.49 GB in size. I suspect that is why the 10.14.3 CU will not work on 10.14.2 — you’d basically be adding code only to immediately rip it out, which is inefficient. Other sites suggest there is a bug in the 10.14.3 combo distribution file where it fails to list all the builds of 10.14. Result is ‘cannot install on this disk’. Annoying when you have dowloaded almost 2.5 Gb of combo update via a slow cell phone connection with a limited monthly data limit. Apparently the update via Sys prefs works ok, & you can even then install the combo update over that if you really want to. The update really messed up iMessage. Take like 15seconds now fter opening to use. No issue(s) with iMessage here. iMac 27 inch 2017. My iMac became uber slow in booting up and not detecting my mouse (Logitech G903) upon reaching the desktop – after this update. Come on Apple, sort this mess out! I am in the process of installing Mojave on my MacPro 2013 again as it is not doing what I would like it to do. In previous versions, I’ll boot from an USB, format the internal hard drive with FileVault encryption, install and complete the setup with a user account. This allows me to have full disk encryption with one password and another password for the user account. Unfortunately, in Mojave, I went through the same process but once installed, it would boot into my user account and not allowing me to enter my FileVault password. The system said that FileVault is on. Can you let me know how I can full disk encrypt with one password and another for a user account? I spent most of the day today trying (twice) to install 10.14.3 on top of High Sierra. Both times, 20 minutes from being completed, iMac went into an endless loop. Only recourse was to rebuild disk from Time Machine, an excruciating four-hour process. Guess I’ll just stick with High Sierra. Mojave isn’t worth the effort and heartbreak and gnashing of teeth! I can’t believe Apple actually released this. I thought surely by .3, we’d have a smoothly operating system. Cook definitely did NOT earn his performance bonus this time around!